Although I make it a personal mission to be as informed on as many upcoming releases as possible, every now and then I see a trailer in the cinema for something I never knew even existed until then. That’s certainly the case with Monsters and Men, a film that somehow completely slipped by my radar despite debuting at last year’s Sundance Film Festival to favourable reviews, and I only found out about it when I saw the trailer attached to screenings of Creed II; I remember being so blindsided by this movie’s mere existence that I decided to seek it out upon its eventual release just so I can reminisce about being taken by surprise in this instance, regardless of what the quality of it would end up being. Finding a cinema that was showing this, however, wasn’t as easy as I thought it would be; apparently, UK distributor Altitude has also scheduled a digital release at the same time as a very limited theatrical run, which suggests that any hope they have for this film’s longevity with audiences is practically nil, a sad thought in and of itself because Monsters and Men is a pretty good movie that deserves a bigger audience than it’s getting. The film follows three characters around a New York community; first, there’s young father Manny (Anthony Ramos) who witnesses and records a police shooting of an unarmed black man, later uploading the video to the internet and facing antagonism from the bullish cops behind the shooting; then, the focus shifts to Dennis (John David Washington), an African-American cop whose loyalty to the police department is called into question when he finds it difficult to accept his colleague’s mistake; and finally, there’s young baseball hopeful Zee (Kelvin Harrison Jr.) who becomes involved in the community’s political activism to protest the shooting. All three characters’ stories are introduced and told in that order, in an interesting and experimental manner by writer-director Reinaldo Marcus Green that sees the focus passed on from one person to another; as soon as the baton has been handed to the next character, the previous one is practically gone from the rest of the movie. The results to this are a little iffy; on the one hand, it allows for a seamless transition from one perspective to another which certainly seems to be Green’s intention, but on the other hand the characters that are introduced along with their arcs do rather suddenly just come to a complete and utter stop with a number of threads left hanging. When it does suddenly cut to our next main character, you’re left wondering whatever became of the ones you had just left behind, especially when where their story is left does leave you wanting a lot more than what you are given; Ramos’ character is left in a very troublesome position when it moves on to Washington’s character, but the movie never cuts back to him or gives him any kind of real resolution despite it very much needing one, which makes it a little frustrating watching it and knowing that this movie has no intention of wrapping up such a pivotal development. However, that’s really just the only major glaring hole in what it otherwise a powerful, timely, and superbly performed drama that takes such a heavy topic such as police brutality and actually lets us explore it from multiple angles. Movies like The Hate U Give and Fruitvale Station, as powerful as those films can be, only really tend to take just one focus while giving a more black-and-white opinion on other parties such as the police involved with the shooting; in Monsters and Men, Green has taken the extra liberty to actually explore such an issue from the perspective of not just the bystander that witnesses the event, but also reactions from inside the police force as well as the growing amount of protestors that are calling out the police for their actions. It’s a neatly layered movie that really takes its time with these separate perspectives so you can see just how this particular incident affects each and every one of them differently, and issues with its shifting of focus aside the film flows very naturally at a rather brisk pace that’s leisurely but not too comforting. The three lead actors all do some marvellous work here as well; Anthony Ramos, last seen as Lady Gaga’s friend in A Star Is Born, is a likeable presence who you really identify with and feel sympathy for when he’s being targeted for doing a merciful act; BlacKkKlansman’s John David Washington has perhaps the strongest arc in the movie, and gives the most compelling performance out of the trio as you really feel his growing frustration with being constantly berated by people for his job (a dinner scene with some neighbours gets out of hand very quickly) and sometimes for the colour of his skin, as demonstrated in a tense opening scene that sees him being pulled over by a fellow cop whilst he’s wearing plain clothes and blasting Al Green on his stereo; and while Kelvin Harrison Jr. is perhaps saddled with the least interesting character he still gets to shine in some scenes that are pretty dramatic and incredibly powerful. Their strong performances are key to this movie working as well as it does, especially in how it again leaves you wanting more from them when the movie suddenly cuts away to the next character. Overall, I was glad that I not only found out that Monsters and Men existed, but I was able to seek it out to see if for myself, and having just very recently gotten another trailer for a previously unheard-of movie – that one being the Judi Dench drama Red Joan, due out in April – I hope to have this same experience at least once more this year. 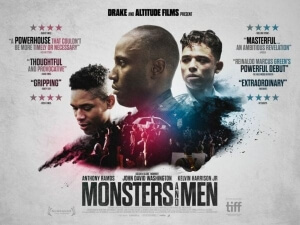 Monsters and Men offers a set of powerful and compelling perspectives on a police shooting incident which just about holds together with swift, but not always smooth, focus shifting and three strong lead performances.